This latest installment of Bands in the Neighborhood is on SweetBread Jim's, who play Americana/indie rock and are owned by a mysterious benefactor. Or are they? They play next this Saturday at Columbia Heights Day at 2 pm. And if you're a Band in the Neighborhood and would like to be part of this series, email me. Linsay (Songwriter, Vocals, Guitar): The members of SweetBread Jim’s come from very diverse backgrounds. I have been singing since early childhood and have a background in choral music, musical theater, and classical singing. My songwriting influences span many genres. The songs I write definitely tend to be melodically driven and put a strong focus on the vocals. Lanou and Lewis are the ones who really make us rock! Jon Lewis (Drums): I obtained my musical inspiration from my father, vocalist and music educator, Gregory Lewis. My musical background started in church in the 6th grade, playing gospel at my home church, Lincoln Park United Methodist Church. I was brought up under the wing of Calvin Jones Jr. and other great musicians. I started embracing music more in junior high where I studied under Richard Gill and then moved on to study with a great percussion teacher and mentor, Kenneth Dickerson, at Wilson High School. Currently, I am obtaining my music education degree at UDC and plan to be a music educator and working musician the rest of my life. John Lanou (Bass): I studied classical music criticism in college (not performance -- I have little training) as well as African rhythm. As a result i think i focus on classical harmonies but add a bunch of syncopation. Most of my prior projects have been instrumental and post-rock. Linsay: Well, the owner of the band, SweetBread Jim, decided to name the band after himself. 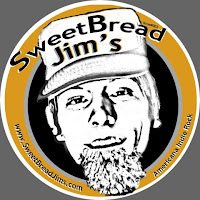 SweetBread Jim is from Wheaton, MD. He had always wanted to break into the booking business because he was getting sick of working at his dad’s used car lot scraping the old car prices off windshields and writing on the new prices. He found us on Craigslist and purchased the band for $20; he has been trying to get us gigs ever since. He still works at the used car lot, though. So, SweetBread Jim’s is actually short for SweetBread Jim’s Band. How many members live in Columbia Heights? Whereabouts? Linsay: Two of us, Lanou and I, live in Columbia Heights. Actually, I lived in the apartment below his group house a few years ago and that is how we met. When I went to view the apartment for the first time, he was having band practice with another band upstairs;it was loud and rockin’. I knew I had to live in that apartment after hearing them. Now I live on Sherman Ave NW. And although Lewis doesn’t live in Columbia Heights, he is a DC native which is pretty awesome. Lanou: I live next to Bloombars, the new epicenter of local home-grown music. Linsay: We’re taking it slow since we’ve only been together since October 2010. We are working on our DEMO CD!!! right now. It will feature 3-4 songs. Lanou: If SweetBread Jim says "make a record," we make a record. Lewis: I feel good about the recent demo recording session. I’m ready to get back in there and get started on our first album. Any crazy or terrible tour stories? Lanou: Playing local gigs has been quite sufficient for the collection of ridiculous anecdotes. To protect the identities involved, we will not name names until we're rich and famous and have a PR team from L.A.
What’s your take on the music scene in Columbia Heights and in DC? Linsay: I’m still trying to get a grasp on the music scene in the neighborhood and in DC. This city is so diverse in its population and that is reflected in the music scene. I know that the scene I am involved in is pretty cool. Musicians here are very friendly and always trying to help each other out. At the Wonderland on Sunday nights, Ian Walters hosts a weekly unplugged show that always features local and regional artists. That is the best spot in the ‘hood to catch some good music. We play there from time to time. And if you had to rename your band for something Columbia Heights-related, what would it be? Linsay: “The Columbia Heights’ Awesome Band”? Lanou: "SweetBread Jim is Buying Your Neighborhood"
Wow Sweetbread Jim's. Made the blogosphere. Simply astounding music. If you get a chance check em out. Pho 14's expansion opens on Thursday! Earthquake! Spot any damage in the neighborhood? Explosion last night around 11 pm? Room 11's second anniversary party today, Aug 10! Too many bikes on the sidewalks? Z-Burger in the Tivoli opening "Summer 2011"
Vintage store Hella Tuff closed!